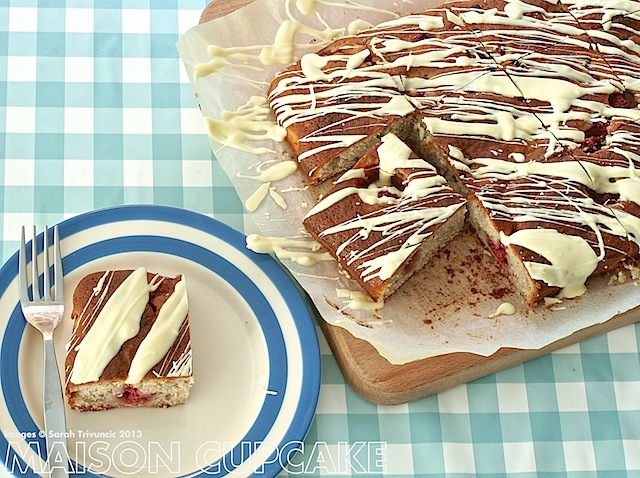 Cake sales call for tray bakes and this easy recipe is perfect to whip up at short notice. I have based the ratio of ingredients on the apple, prune and rosemary cake which we made at the Activia Feel Good Cook of the Year day. I see myself using variants of this recipe a great deal; I like that there’s no need to cream fat and sugar. It’s as fuss free as making muffins with the added advantage of containing less saturated fat than a butter or margarine based cake. My new best friends in the kitchen are rectangular foil baking trays from the supermarket. They’re cheap enough to donate to the school bazaar without needing them back but sturdy enough to use more than once at home. Equally you could use them for brownies or flapjacks. You can really ring the changes with this Activia yogurt based sponge cake – mix and match fruits, tinker with which flavour yogurt, vary the ratio of flour to almonds, scatter over different toppings. I can see endless possibilities and aside from the chocolate topping used here, the whole thing can be mixed and baked in under an hour. Conveniently too the recipe uses 2 exact 125g pots of Activia yogurt so that’s one thing at least you don’t need to measure. A double boiler is good to melt the white chocolate – I find white chocolate seizes too easily in the microwave – but if you don’t have one of those a heatproof bowl over a saucepan of water is fine. Just make sure the boiling water doesn’t touch the base of the bowl. The raspberries here came from our gigantic garden glut back in the summer. I have an entire freezer drawer stuffed with them and a plan to make jam but having seen how well this worked I will definitely keep a bag back for cakes. 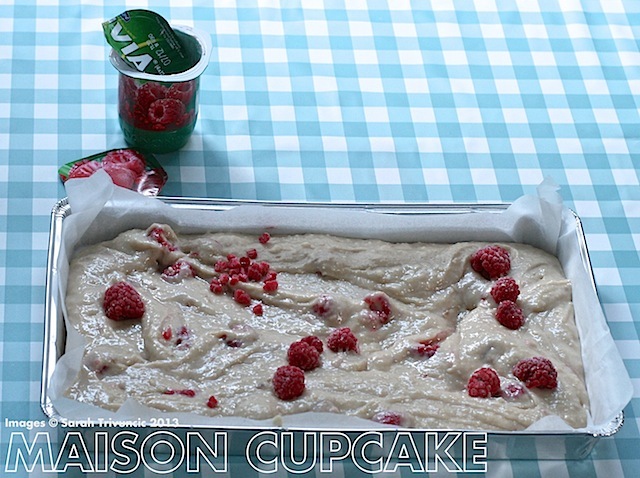 Naturally you could use fresh raspberries in season. 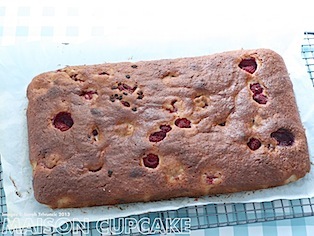 This cake should keep in a tin for 48 hours however be mindful that the raspberries may spoil quickly after that. My husband is taking the leftovers to this office tomorrow but knowing him he will bring that foil tray back anyway! These are the ingredients you need (detailed list in the recipe below). 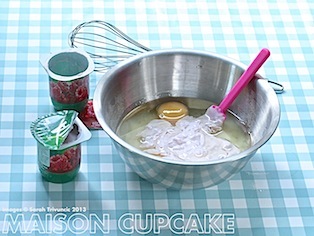 Mix the eggs, sugar, Activia yogurt and oil together lightly with a whisk until just combined. Sieve over the flour, baking powder and almonds. 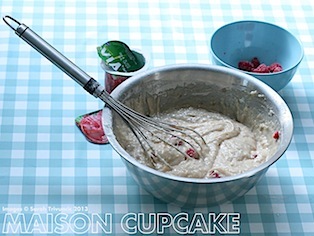 Lightly mix that in too – stir in 2/3 of the raspberries but save some to scatter on the top. Like this – it just looks pretty that way! Bake in the oven at 180c / Gas 4 for around 40 minutes until golden brown and a cocktail stick comes out cleanly. Once it’s cooled drizzle over some molten white chocolate. Allow the chocolate to set again before cutting into squares to serve. You will need a 24cm metal rectangular baking tin and parchment baking paper. 1. Preheat the oven to 180c / Gas 4. Cut the parchment paper to fit the baking tin leaving the sides around 5-6cm high. 2. 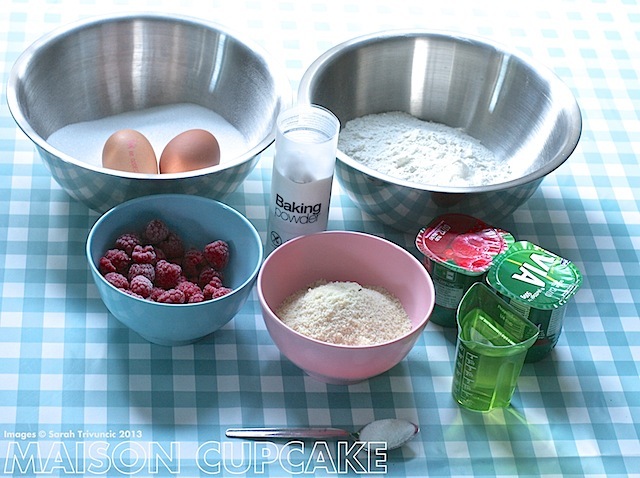 In a medium size mixing bowl lightly whisk together the Activia yogurt, eggs, caster sugar and oil. 3. Sieve in the flour, baking powder and almonds and fold in until just mixed. Fold in 2/3 of the raspberries. 4. 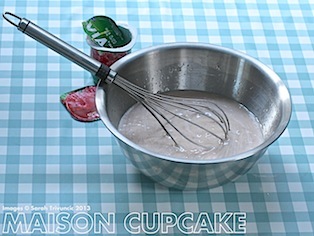 Pour the mixture into the lined baking tin and coax towards the edges with a spatula. 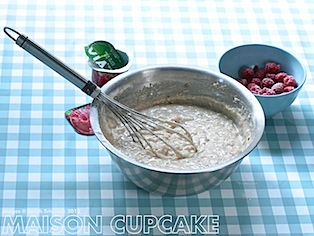 Scatter the remaining raspberries over the top. 5. Bake for around 40 minutes until the top is golden and a cocktail stick or wooden skewer inserted into the cake comes out clean. Remove from the oven and allow to cool in the tin for a few minutes before lifting by the paper and placing on a wire cooling rack to cool completely. 6. Using a double boiler or a heatproof bowl over a saucepan filled with 3-4cm water, melt the white chocolate gently. 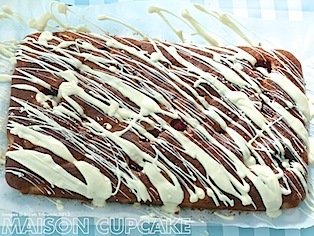 When molten use a fork to drizzle white chocolate in diagonal stripes across the surface of the cake. Allow the chocolate to cool and harden again. Cut into squares to serve. Recipe commissioned and post sponsored by Activia as part of their Feel Good from Within campaign. Stay in touch with Activia at Facebook.com/activiaUK or say hi to them on Twitter @activiaUK . See also my interview with Activia brand ambassador Gok Wan. A delicious looking cake! It must taste wonderful. This looks delicious. I am going to share with my daughter as she’s committed to a bake sale for school to raise money for the phillipines fund. This looks easy and healthy! Thanks Urvashi, I think these are real winner for a school bake sale – very high glory to effort ratio as Fuss Free Helen would put it! 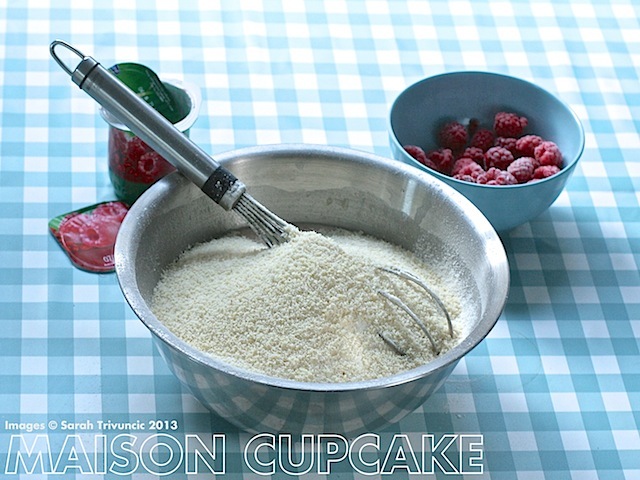 It’s a lovely soft cake and so easy. I don’t think I’ll be inclined to do traditional way for a while after this! 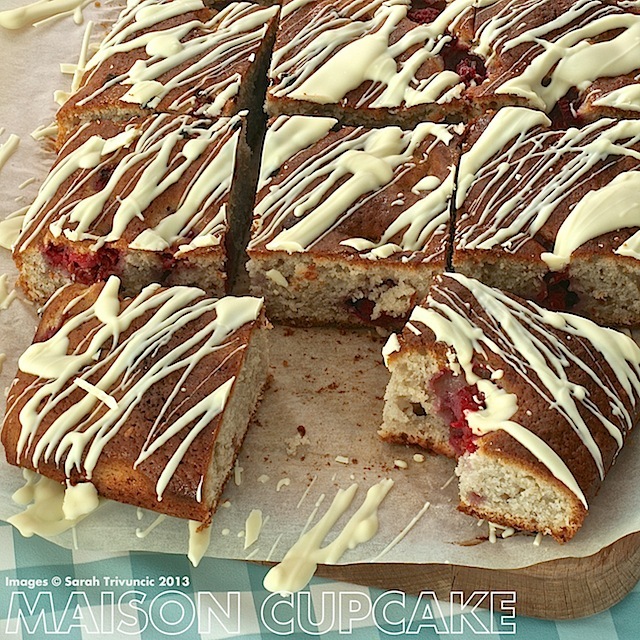 loe the addition of yoghurt here but most of all LOVE the messy icing… so cool! Thanks – it was very satisfying! It looks so tasty and a lovely recipe for sharing, it’s always lovely to have an alternative to mince pies etc at this time of the year. I’m a fan of those foil trays from the supermarket too – having less to clean up at the end is always a plus! 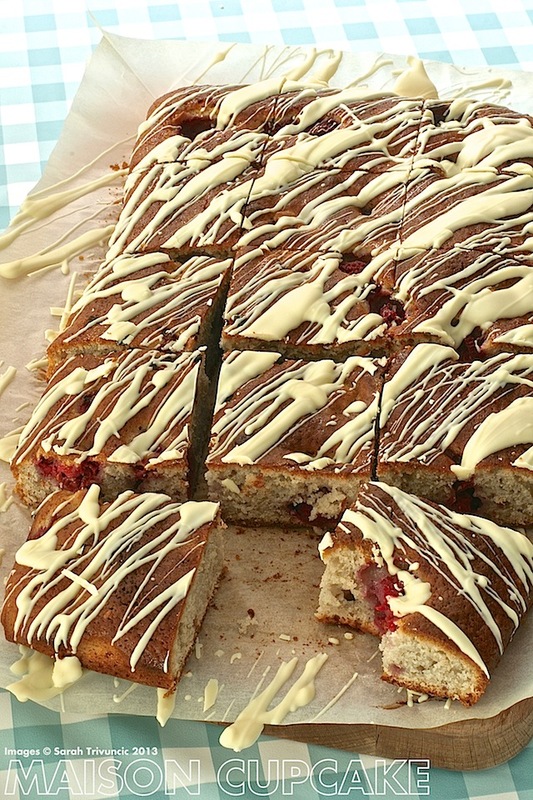 This traybake looks delicious, can’t wait to give it a go myself . There is nothing like a tray bake. So easy, but also very impressive with that icing on it. Omg I loved this recipe can’t wait to try it, thank you so much !